Where does Girl Scout cookie money go? Here in the US, it's Girl Scout cookie season. This is when you get to spend a few bucks on cookies, break your New Year's resolution about losing weight ... and feel good about it, because the money's going to a good cause. Or is it? - Let's break down the numbers and see! In a previous blog, you might recall that I combined analytics and Girl Scout cookies by creating a SAS map showing which of the two bakers made the cookies sold in each county in the US. 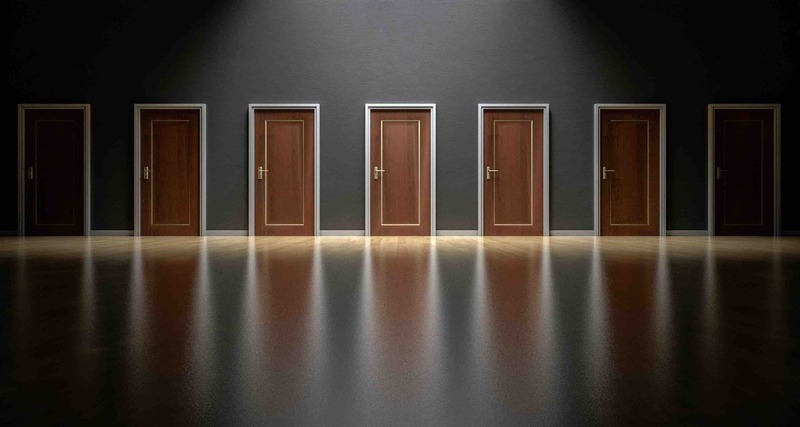 In this blog post, let's get down to dollars and cents. Being a middle-aged guy and working a desk job, I try to not eat sweets & snacks, because I don't want to become one of the almost 50% of Americans who are considered obese. So, when my local Girl Scout troop sends representatives to sell me some cookies, I'm thinking about just donating some money instead. But how much money should I donate, to compensate for the cookies I didn't buy? My first guess was that on a $4 box of cookies, the Girl Scouts probably makes $1 profit. But after I checked into it, I found out I was wrong ... way wrong. According to the Girl Scouts FAQ page, they actually make 65-75% profit, which means that about $3 from each $4 box goes to the Girl Scouts. And the FAQ on their web page says most of the profit goes to the local council (which is typically a group of counties within your state), and a smaller amount (10-20% of the profit) goes to the troop (that's the local club in your city/area). 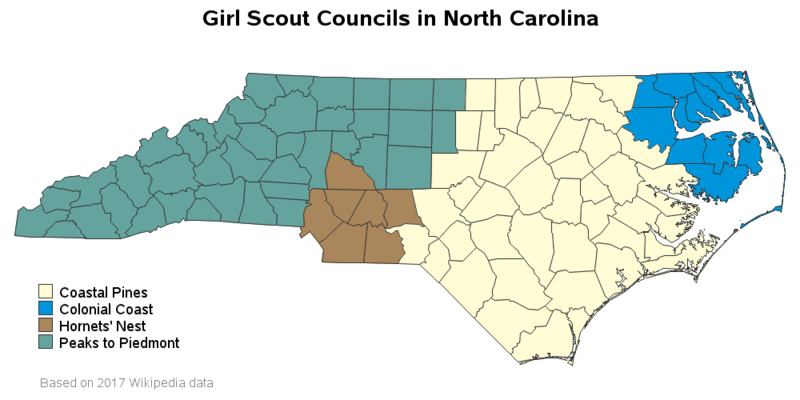 I was curious exactly which council our local Wake county NC Girl Scout troops were in, so I did some Google searches looking for council maps. I found some maps for other states, but none for NC. I found a Wikipedia page with lists of counties in each council, but text lists of the 100 counties just didn't form a good mental picture for me. So I put together some SAS code to plot the data on a map. Now I can quickly see that Wake county is in the Coastal Pines council (the light yellow color in the map below). When you buy Girl Scout Cookies, you power amazing adventures and life-changing opportunities for girls—from trips to our nation's capital to community projects, from summer camp to charitable donations. The more cookies you buy, the more you help today’s girls transform into tomorrow’s G.I.R.L.s (Go-getters, Innovators, Risk-takers, Leaders)™. And it's about the skills a girl gains from interacting directly with you, the cookie customer! It's about the experience of running her very own cookie business, working with others—and building a lifetime of confidence as she learns five skills (goals setting, decision making, money management, people skills, and business ethics) essential to leadership, success, and life. Girl Scouts also earn badges (such as Cookie Business and the Financial Literacy) and program credits for selling cookies. I don't think donating money will accomplish many of those things in the same way that buying the cookies would. And then there's the sense of accomplishment - if you were a Girl Scout selling cookies, would you rather tell your friends "I sold 20 boxes of cookies" or "I got a $60 donation"? Still Hungry? Where Are Your Girl Scout Cookies Made? Does any of the money go to planned parenthood? I'm not sure - perhaps you could ask that question directly to the Girl Scout headquarters. Sounds like some great alternative ideas! One interesting tidbit I discovered: GS Cookie Sales is an $800M business. Also a division of Interbake, is one of the bakers make GS Cookies, and another division makes Oven Baked. When I am in a 99C Only Store, or a Dollar Tree, I buy Oven Baked. The sq choc covered mint cookies tastes like Thin Mints to us. They were so close in flavor, I did some due diligence. http://www.interbake.com/abc-bakers/ GS Cookies and Oven Baked brand baker. This is a fascinating blog, and all the comments have been intelligent and pertinent. I was a poor kid (euphemism "under-served"), and my GS camp and other activities were paid for by the local Council in the 1960s-early 1970s. I was a GS until I was 14. It kept me out of trouble, and it taught me so many life lessons. Back then (I am assuming), the GS was run like a non-profit, and not like a for profit, which most behemoth non-profits have morphed into. The Council buildings back then were C level real estate buildings, and the layers of bureaucracy were less, according to my mother. I'll tell you, the 990 I checked out wasn't easy to digest. I call GS Cookie Sales Child Slave Labor these days. I call it as I "seez" it. Nice job if you can get it... no, not Girl Scout sales lady, but GS Cookie company... yes they make a tidy EASY profit from the cookies the girls sell, because they don't have to buy shelf space in grocery stores or do any advertising. Also, the cookies contain things that are very unhealthy... like HFCS. So, I won't eat them and I can't live with my conscience buying them and having them given to our troops or the homeless, etc. Personally I feel like I am being blackmailed! 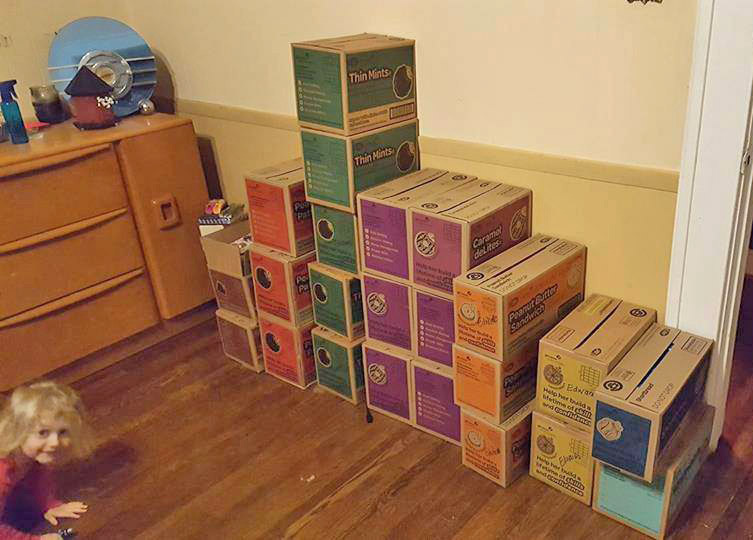 My grand daughter will probably be made to feel bad even when she brings in my $50 donation (worth more than selling 12 boxes of cookies to her troop). Why... because she didn't sell the cookies! But the worst part is most people think it is only the sugar in the cookies that is a problem. After all, what is a little sugar if you aren't obese? (Read all the long term effects of too much sugar in your diet!) It isn't JUST the sugar! It is the high fructose corn syrup and other additives and preservatives. I simply don't like feeling like I am being blackmailed by the Girl Scout Organization. And the only real winner is the cookie company! Isn't there something healthier they could sell? Or maybe do a Rainbow program, where the Scouts do chores for people and the troop gets paid for the chores the girls do. That would be 100% profit! And in addition to learning about business, they would get some exercise doing chores. I'm sure there are many better ways to raise money than selling a product that harms the health of all those who eat the cookies! I found this troop's cookie guide online. It has two breakdowns that give more information on how the proceeds are divided up and how much each girl is credited. Does not give enough information on each line item, but does give more than the girl scout website. Might make an interesting chart! The Girl Scouts need to get their heads out of the sand. My great niece, a Girl Scout, lives in Washington State and has family all over the country, we all want to support her. But who wants to pay all that shipping? GS need a program where she makes the out of her Community sale and a local GS in the buyer's Community makes the delivery, and they share the profit. Sales would mushroom! I just can't believe they don't do it. In 2018 the girls will make 5cents, yes 5 cents per box. But the more they sell & parents attend the cookie rally they will get more. BUT, they don't tell you how much. I almost feel like they are pimping them out for chump change. The girls work hard selling those they at least deserve $1. Is that Heywood Wakefield furniture I see? Here (Raleigh) the troop gets about 50 cents a box out of the $4.00. The Council office does a ton for us and is indispensable. Our troop has used the camp facilities for three activities (at a nominal fee), gotten all of our leaders CPR and First Aid certified for free and gotten lots of help with building our troop from 10 girls to 30 girls. Given all that we get from council, we have no issue with 2.50 out of the $3 going to our council (with a portion to national as well) . In my area, Girl Scout cookies cost $5 a box. I agree with previous comment about local troop only getting a tiny fraction of the money, my local group only gets about $.25 /box. Make the donation, it goes further and keeps the girls out of slave labor. Somebody needs to put you region on report $0.25 on $5 box is really not right. You must have some major camp ground costs or something. Now I'm curious about what the local councils do for the individual scout troops. The answer for our troop is...not much. Membership costs just went up and I've paid out almost $300 this year so far in dues (I even have to pay for my background check to be allowed to sell cookies for them), badges, outfits, etc. for my two daughters. That amount will go up seeing as it's only early Dec & I'll probably have to fork out more for additional badges (yep, badges aren't free), camp fees (our camping trips aren't free either), etc. Our troop opts (without parental input) to put cookie sale profits towards one big trip...which always falls on a weekend we're out of town. Check out the girls scout store full of plastic trinkets they encourage the girls to buy. It's like volunteering to sell for Hello Kitty. The increasing costs have caused our troop to lose membership from wonderful girls whose parents are more financially strapped. Our troop leaders do an excellent job and are all dedicated volunteers, but their well funded housewives, so I don't think they are in touch with that. They always say please let us know if finances are an issue and they'll cover the expense, but no one wants to admit it they can't afford the dues & they just drop. I'm ok with paying out for my kids activities and am blessed with the means...however, I don't care to pay for activities that badger me to volunteer my non-existent free time & take my money. Girl Scouts may have been something great in the past, but now it seems like a brilliant corporation that exploits child labor. They should have their non-profit statues revoked. Nonetheless... I keep my mouth shut. My girls like to hang with their friends & I must muzzle my protests for their sake. I've tried without success to get them to do karate or soccer instead. I'll be one of those parents smiling at the cookie booth soon, take pity on me and buy the darn cookies. Thanks for opportunity to speak freely about this sham. Excellent post Beth. My oldest child became a Daisy this fall so I'm completely new to this but already relate to exactly what you're saying. Volunteered to be cookie manager and just started researching the organization a few weeks ago but not liking what I'm finding so far from a perspective on where revenues go. As an accountant specializing in tax I have an appreciation that what is visible right off the publicly available Form 990's only scratches the surface of the story to be told and even those present an ugly picture. However, like you I am conflicted. My daughter loves it and we have an outstanding Troop Leader (even in spite of it being her 1st year). My Cookie Mgr booklet from Council claims "more than 74% of the price stays local" and the GSUSA goes further by stating "100% of the net proceeds stays local". Our Troop will directly receive $.90 per $5 box so it saddens me that almost $3 ($1 to baker plus $.30 GSUSA royalty) is "necessary" to fund a Council that you would think would be quite efficient after a 100+ years of effectively the same operation. Then there's the subject of another whole layer of salaries and benefits at the national level doing who knows what on top of the Council staffing. According to the GSUSA's own financial statements there is over 59 MILLION alumnae, I am left to wonder how it is that there aren't enough of them willing and in a financial position to give back and qualified to fill most, if not all, of the salaried positions as volunteers. 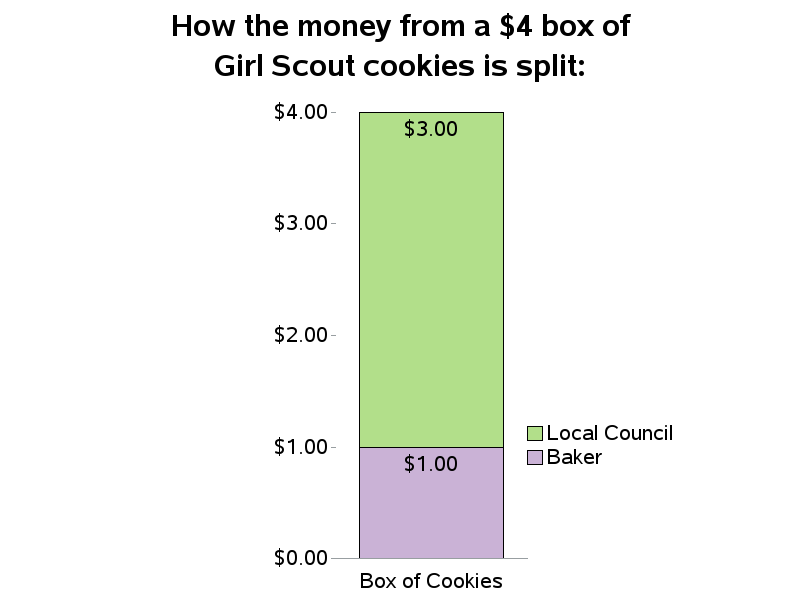 In our area, the cookies sell for $4 and our troop only gets about 50 cents (the exact amount depends on the number of boxes per girl) So if you buy a box and offer a $1 tip, we actually make more on the tip than the cookies. The NC Coastal Pines participates in Operation Cookie Drop. You buy however many boxes and the council sends them to our service members and their families! Thanks for this extra info - Sounds like a great idea! Just realize he said $3 out of $4 goes to the Girl Scouts proper NOT the girls. The girls' troop receive less than a dollar. The majority of that money goes to maintaining the camp grounds and those costs are shared with the Boy Scouts. And this money also pays the salaries of corporate and other employees of the scouts and necessary training. When I was a leader 15 years ago @$2.50 a box the girls got $0.20 per box (with30 girls that paid for lot) and the highest regional (there are people above them and I am sure they got paid even more) was paid $70k a year. Which across all the troops in a region isn't much but 15 years ago that's a lot of money that the girls make selling cookies!!! That's child labor in a way! AND interestingly enough the Boy Scouts get a much higher profit from their sells because the price for a box of pop corn is rediculous!!! And they receive an extraordinary amount of corporate sponsorship that the Girl Scouts don't come close to receiving. If you are making the kind of money corporate is making, then they should going after the sponsors!!! I am not saying don't buy cookies I am saying that the corporate employees should be working harder for their money and the parents and public should made more aware and they be more upfront about the costs. I would think the training and the camp grounds take up the most of profit, but I dont remember and they need to be more honest and detailed about where the profits specifically go. Accountability is an issue to me and to say the girls Scouts make $3 profit, but it is a misnomer and not a complete answer. A lie of omissision as they say. Don't get me wrong, the girl used that money to go to Busch gardens, a sleep in at one of local museums ( my girls loved the zoo snooze) and a troop camping trip. And that's 30 girls all expenses paid, except the food at Busch gardens (which is a local park - day trip for us). And they loved it all. That cookie and dues paid for badges and craft supplies and local day events for badges. So it went a long way. You are spot on! I was a co-leader for a small troop and I worked my tail off transporting, distributing and helping the girls sell these cookies to make 54 cents per box! The Boys Scouts make a TON more money off their sales and now the boxes are even MORE expensive! They are robbing these girls blind! Someone is getting rich and it's not the girls selling! This is just pure exploitation of these young girls! Be a troop leader! You will be disgusted! It's ridiculous! Donate the money or have them wash your car! Lots more to the girls that way! Nice charts, but the data used is wrong. I think net revenue and revenue have been confused. Many studies have shown that about 80% if the cost to buy a box of cookies goes to make and transport them. About 20% stays with the scouts. They are better served by $1 donations than $4 cookie purchases. 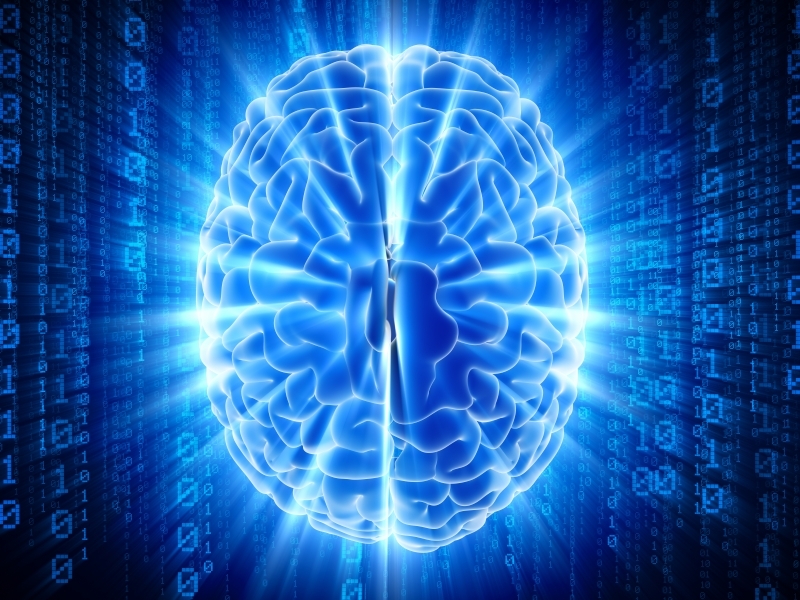 Interesting - do you have a url/link to one of these studies? Robert, I have been a cookie Dad for the past three years and I know exactly how each dollar or cent is spent. Your research is absolutely right on. Of course the troop it’s self selling the cookies get between .65 and .75 cents per box sold. The rest of the money goes back to the Girl Scouts of America. This little bit of money pays the salaries of those who get paid which isn’t much working for a nonprofit. It’s goes to maintaining all the properties the Girl Scouts have through out the United States. The cabins they have are first class all the way and in locations not just anyone can own property. These of course come from donations from the US elite but they don’t usually donate up keep for the next 100 years on these properties. And yes purchasing a $4.00 box of cookies over donating $4.00 goes much further than the $4.00 would. Most partners now days are too lazy to help their girls sale cookies and so the top selling girls really carry the rest who think it’s too much work to teach their daughters life long lessons, including memories. Trust me when the girls get to spend the night in a cabin with 15 of their friends in Garden of the Gods Colorado, is going to leave them with a life long memory. Most parents are too lazy to create these memories and I find it exatremely sad. I thank you for taking the time to educate those who are lucky enough to read your post. Don’t let anyone tell you different, there are a lot of people who I see commented who don’t know their head from their ***. These are the parents who rob their children from such wonderful experiences due to their own ignorance.